Chantelle, a rescue cat, looking gorgeous. I met this lovely lady at the PetSmart in Paramus, NJ last week. 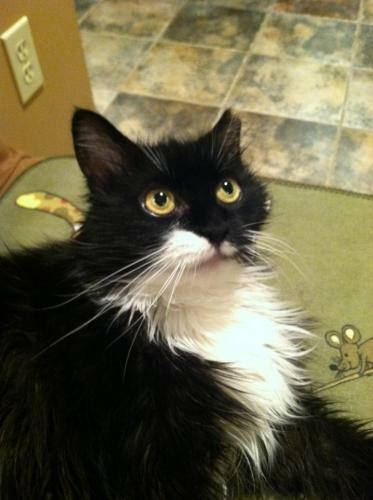 Chantelle is a 10-year-old long-hair tuxedo kitty. Her foster Mom, Kim, told me the cat had a hard life and yet she is a real people-pleaser. Chantelle will delight in spending time with you, but she'd rather not have another cat in the house. Chantelle has a playful nature. You can watch the video of her having fun. If you are looking for a wonderful companion then Chantelle is your forever kitty. For questions, or if you would like to meet Chantelle, please call 201-797-8861 or email startkayne@aol.com Kim also said you could contact her directly at 201-739-7224. If you're interested you can come visit Chantelle at Kim's house. Please note that the Petfinder information says Chantelle is 3 years old. However her foster Mom said the shelter has to update the information as the vet believes she is 10 years old. She is available from START II: Save the Animals Rescue Team II in Elmwood Park, NJ. Awww, she's really cute! She could be Skootch's twin sister - she has very similar markings, right down to her crooked mustache! I hope she finds her forever home soon. Those eyes! Huge shining windows to her kitty soul. She is a beautiful girl and we're hoping she finds her forever home soon. She's a gorgeous tuxie ladycat! We hope she finds a wonderful forever home very soon. I think you have her age listed incorrectly. I believe she may be three years of age, not ten. I will keep her in my thoughts and prayers.